The military’s intelligence unit wiretapped a former president and defense minister and collected intelligence on a large number of civilians, a nongovernmental organization alleged Monday. The latest allegation against the Defense Security Command comes as the Ministry of National Defense speeds up the process of drawing up reform plans for the military intelligence unit. On Monday, the Center for Military Human Rights claimed the DSC listened in on conversations between late President Roh Moo-hyun and former Defense Minister Yoon Kwang-ung. Roh and Yoon discussed issues concerning President Moon Jae-in, who was then serving as a presidential secretary for civil affairs, according to the organization. The center also accused the DSC, which faces accusations of surveilling families of those who died in the 2014 Sewol ferry accident and interfering in political affairs, of illegally collecting information on millions of civilians who visited military facilities. The center claimed the DSC collected personal information provided by civilians visiting military facilities and used the information to conduct background searches. The center added that the police agency provided the DSC with access to its information network on grounds of cooperating in investigations. According to the center, individuals who came under DSC watch included politicians, journalists and students involved in activism. The Defense Ministry, meanwhile, is said to have requested the DSC reform committee draw up the plans by Thursday. According to reports, Defense Minister Song Young-moo requested the plans be submitted by Thursday. The ministry will review the plan before reporting it to the presidential office. The Defense Ministry did not clarify a deadline for the reform plans, but indicated the plans are likely to be drawn up before the end of the investigation into allegations surrounding the DSC. The DSC is currently being investigated by a joint military and civilian investigation team over allegations surrounding martial law plans. 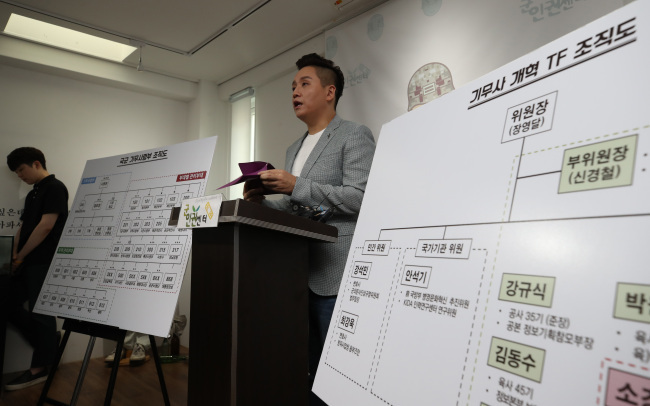 The DSC drew up plans for implementing martial law in the event that the Constitutional Court ruled against the impeachment of former President Park Geun-hye.